The practice of gratitude transforms relationships. It opens us up to the gifts and talents that other people have. Leaders who place gratitude high on their list of values find that they must create an organizational environment that is open and welcoming. A starting place to understand the importance of open hospitality is to ask your employees about the barriers to leadership and the performance of their best work. Many of them, I suspect, will refuse to see themselves as leaders because of past experience or the perception that leadership is a positional role, not a behavioral one. When an organization opens itself up to being a community of leaders, an expectation emerges that people will take initiative to make a difference that matters, and not merely do what they are told, or go along to get along, or only do enough to avoid getting fired. All leadership begins in the personal initiative of the individual. For organizations to be leadership-filled, we must find ways to remove the barriers to personal initiative. We need to open up and make the workplace a more hospitable place. 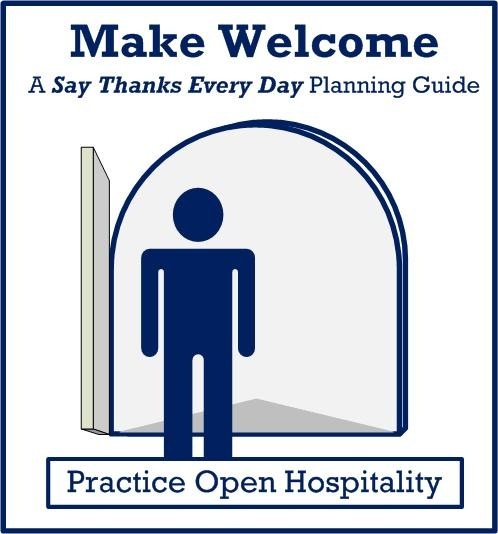 The importance of hospitality came to home to me several years ago from reading Jan Gunnarsson and Olle Blohm’s Hostmanship: The art of making people feel welcome and their follow up book, The Welcoming Leader: The Art of Creating Hostmanship. I was so moved by their leadership perspective that I wrote an extended review of Hostmanship, and later turned into an ebook – Hostmanship: A Leadership Ethic of Personal Responsibility (free download). “Imagine a world where people feel welcome and expected. A world where children, friends, strangers, guests, customers and colleagues dare to and want to meet each other for real. It is our belief that this is the basis for true and lasting success for us as human beings, our organizations and society we have been entrusted”. A practical philosophy on the art of welcoming, comprised on six foundations; serving, responsibility, wholeness, caring, knowledge and dialogue. In addition to Manager and Leader we encourage the face of the Host. Hostmanship looks upon all organizations as Hosts, hosting community, dreams, a vision, a mission, talent, customers, partners and owners. Also the organization as a host in society, contributing to the well being of the whole. To act as a host is to act with gratitude because what we see in that other person is some value or attribute worth recognizing as worthy of attention. This is a giving posture in relationships. We give by opening up our organizations for people to enter into them to contribute and make a difference that matters. The challenge is within ourselves. The challenge is to model the attitudes and behaviors that we would like to see as emblematic of our organization. It starts with leadership, the leadership of personal initiative that shifts from a mindset of control to one of freedom, openness and high expectations for contribution. For many organizations, there isn’t a high expectation for contributing, but rather the burden of meeting the high demands of compliance. In those instances, there is no room for initiative, and is not a place of welcome. 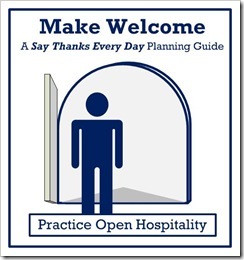 To truly practice open hospitality is to be a grateful person. Grateful for each person who walks through the door. Grateful for the gifts, talents, experience, expertise, character, commitment and good will that they bring. Creating an open and hospitable environment is a start to creating an environment where the potential that each person brings to the organization can be fulfilled. Here’s a handy guide to give you a reference point for how to develop an open hospitable environment in your business. Just envision what it would be like if each of your people were taking initiative in each of these areas. Tagged with hospitality, hostmanship, Jan Gunnarsson, Make Welcome, Olle Blohm, Openness, welcoming.